I'm thrilled to have one of my favourite authors on the blog today, Kathryn Evans. Kathryn has just seen the release of her second novel, Beauty Sleep, which is going down a storm. Last week, I got the opportunity to find out how it all came about. 1) How did you come up with the idea for Beauty Sleep? The idea of being frozen in time and brought back to life in the future has always fascinated me. I wanted to write about how different life is for teens now, the new pressures on them that I didn’t have when I was growing up, it seemed like the perfect vehicle to explore that topic. How would an eighties girl cope in a world full of technology? 2) Did you have to do lots of research on cryogenics before completing the book and where did you go to find the information you needed? I did some – there are cryogenic programmes in existence and the information is all on the internet. Sadly, a young girl with cancer recently went to court to be permitted to be cryogenically preserved, right here in the UK. I read a lot of articles about cryotherapy too – a crazy beauty therapy were you freeze yourself for short periods of time – a young woman died in the US in one of these capsules. The truth is often stranger than fiction! 3) What’s the most unusual piece of information that you found out about cryogenics? Probably that if you don’t have enough money to freeze your whole body, you can just freeze your head! 4) I know the main character Laura was frozen in 1986, what made you choose that year in particular? That was the year in which I was sixteen/seventeen. I knew exactly what it felt like to be that age then because I was that age then! 5) In your school presentations, you have strong opinions about how advertising and the media portray body image, what message are you hoping to get across to your young adult audience? I want to start a discussion about the distorted views of our bodies that are pushed at us by celebrities and people who are trying to sell us products. Young people are hard wired to rebel, they can reject this push for super white teeth and perfectly smooth skin and tiny waists and and and…I want people to accept themselves and accept others – we need to be a bit kinder to everyone about how we look. 6) What advice would you give a teenager who dislikes the way they look? This is so hard because it’s very easy to say ‘accept yourself’ but sometimes it’s very difficult to do. I’d say if you’re on social media, follow people who present a positive body image – not people who make you feel bad about yourself. Those people who make you feel bad are either trying to make themselves feel better or they’re trying to sell you something. But if your body image is really getting you down, you might need some help to feel better about yourself, speak to a trusted adult about maybe talking to a counsellor. 7) Would you like to be cryogenically frozen? And if so, what would you like to be woken up in the future to witness? I really wouldn’t. I hate the idea of waking up and all my family and friends being gone. I’m not afraid of death – I think my life has been amazing so far, I don’t want it to be done, but I fell like I’ve packed a lot in. When it’s time to go, it’s time to go. 8) I have to mention the book cover, as it stunning. What was your first reaction when you saw it? I was speechless. Honestly. It’s genuinely the most beautiful book I’ve ever seen. Will Steele designed it and I just think he’s brilliant! 9) What has been the best question you have been asked by the kids in the schools that you have visited? With this book, “Do you dress like that to show off your figure.” It was so pertinent and I thought I’d answered it as best I could but I think I wasn’t wholly honest. I’d said not really. 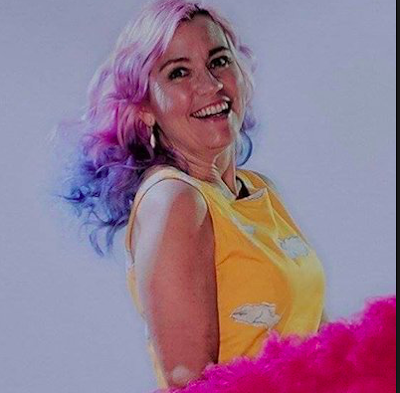 And explained that I dress colourfully and in pouffy skirts primarily because I like it but also so that I’m highly visible and recognisable. But…I do wear flattering dresses and cardigans that don’t make me look too wide in the waist – that’s not how I dress in everyday life where comfort is key so probably, she was a little bit right. You see, even I get sucked in! 10)Knowing a little about your publishing journey, what writing advice would you give to an unpublished author? Keep going, keep learning, keep reading. I see so much talent in my unpublished friends, one day it must be recognised. It must! Thank you Kathryn! Such fabulous answers. 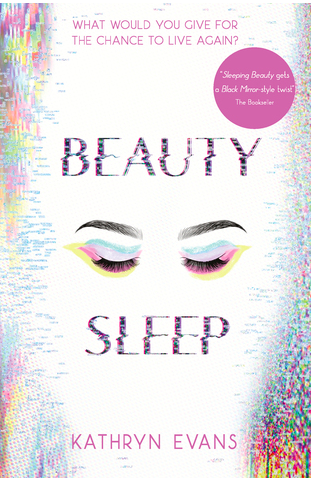 Beauty Sleep is available to buy now, published by Usborne. Laura was dying. There was no cure for her illness. So her family decided to grasp a desperate last hope - Laura was frozen until she could be cured. But what happens when you wake up one day and the world has moved on forty years? Your best friend is middle-aged, your parents presumed dead. Could you find a new place to belong? Could you build a new life - while solving the mystery of what happened to the old one?